Rwanda's 8.5-megawatt Agahozo-Shalom Youth Village solar farm is one of the hallmarks of the Obama administration's 2-year-old Power Africa program. The $24 million project was developed by private firm Gigawatt Global with support from Power Africa partner the U.S. Overseas Private Investment Corp. Photo by Sameer Halai. KAMPALA, Uganda -- Power Africa, the Obama administration's effort to infuse billions of energy investment dollars across sub-Saharan Africa, is entering its third year focused on completing up to 30,000 megawatts of new generation projects while adding 60 million new grid connections across the world's least-electrified continent. Yet for all its ambition, the $7 billion program, rolled out in Cape Town, South Africa, in 2013 and likely to be touted by Obama on his upcoming trip to East Africa this month, has gained relatively little media attention or public notoriety compared with other major energy initiatives happening here. For many Africans and Africa observers, the massive Medupi and Kusile coal plants being built by South Africa's Eskom at a cost of more than $20 billion, or the 6,000-MW Grand Ethiopian Renaissance Dam under construction on the Blue Nile River for an estimated $4 billion, are hallmarks of the continent's progress toward electrification. Power Africa, by contrast, is delivering more targeted energy projects across a more diverse group of countries while quietly leveraging more than $20 billion in private-sector spending, according to Adi Raval, chief spokesman for the initiative at the U.S. Agency for International Development, which is coordinating the program on behalf of a dozen federal agencies and offices. Power Africa is also broadening its emphasis beyond utility-scale power to help bring distributed energy, mostly off-grid solar, to parts of the continent that are not, and probably never will be, connected to a power grid. To date, more than 40 private-sector partners have committed upward of $1 billion to the program's "Beyond the Grid" initiative, according to USAID. Andrew Herscowitz, the Obama administration's Power Africa coordinator, told African media last month at the World Economic Forum in Cape Town that the program has shed its initial focus on six countries -- Ethiopia, Ghana, Kenya, Liberia, Nigeria and Tanzania -- in favor of a more open process that seeks the best energy investments on the continent. "We are not necessarily choosing countries, per se," Herscowitz said. "Rather, we are trying to figure out where the best opportunities are for us to have an impact. We look for countries where there is a champion within the government to make the difficult reforms that are necessary so that the private sector will want to invest in the country." Financial support for Power Africa has extended beyond the State Department's initial $7 billion commitment to include contributions from other agencies, such as the Millennium Challenge Corp., created by Congress in 2004 to link foreign aid to good governance. A spokeswoman for MCC said the agency will invest $2 billion in African electrification projects in countries like Ghana, Malawi and Benin under recently formed five-year compacts. The World Bank Group also committed $5 billion to Power Africa last August, along with the African Development Bank, which pledged $3 billion over five years, and the government of Sweden, which invested $1 billion in the effort. 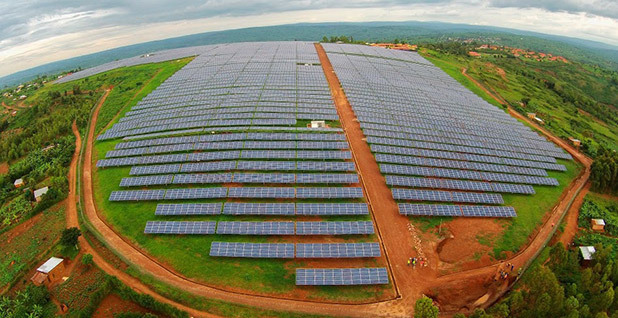 As of March, according to USAID figures, Power Africa has helped close deals accounting for 4,100 MW of electricity in places like Rwanda, where East Africa's largest solar array began sending 8.5 MW of electricity to the national grid late last year, boosting the country's electricity generation capacity by 6 percent. The $23.7 million solar project -- built on a 50-acre site leased from the Agahozo-Shalom Youth Village, established to care for children who lost parents to Rwanda's 1990s genocide -- was developed by the Dutch-American firm Gigawatt Global with support from the U.S. Overseas Private Investment Corp. (OPIC), one of the 12 U.S. government agencies behind Power Africa; Scatec Solar ASA of Norway, which engineered and built the solar plant; and government investment arms and development finance institutions from the Netherlands, Norway, Finland, Austria and the United Kingdom. Chaim Motzen, Gigawatt Global's co-founder who led the development of the Agahozo-Shalom solar plant, said in an interview that OPIC's $400,000 grant came at "a critical time" for the project, which was conceived in 2012 but met hurdles as it neared closing on its financing agreements. The Power Africa grant, issued under the U.S.-Africa Clean Energy Finance program administered by OPIC, helped Gigawatt Global secure necessary funding and get the project built and producing power within 12 months. Today, the project's output flows to the Rwanda Energy Group under a 25-year power purchase agreement, where it is churning out enough electricity for more than 15,000 Rwandan homes. "There are a number of players that were critical for making all of this come together," said Motzen, a Harvard University graduate and former McKinsey & Co. consultant based in New York. "Power Africa was one of them." Nearly 1,000 kilometers to the east, in Marigat, Kenya, Power Africa is partnering with U.S.-based Cummins Power Generation and Kenya Power & Lighting to construct a 11.5-MW biomass power plant that will burn invasive mesquite, locally known as "mathenge," that was introduced to East Africa in the 1960s to prevent desertification but has become a nuisance in herding regions of Kenya. In addition to producing power, the Cummins Cogeneration Ltd. facility is contracting with farmers in surrounding Baringo County to harvest and deliver the trees to the plant. Grace Kipesa, a local resident who plans to supply biomass to the plant, told Kenya's Daily Nation newspaper last year that the onetime nuisance species has become "a blessing" because "it is now enabling us to pay school fees and settle bills with ease, while our villages get lit up." The Kenya project has met some environmental criticism, however. In May, a group of Kenyan forestry experts, including the conservation secretary of the country's Environment Ministry, warned that the mathenge tree could be at risk of extinction if the cogeneration plant's need for local biomass leads to overharvesting of the trees. The secretary, Gideon Gathara, said more research should be done on harvesting of mathenge before the biogas plant reaches full capacity. Cummins Cogeneration officials have said the company is taking measures to ensure it does not promote overharvesting, and that the species' fast-growing nature would make it very difficult to drive the tree to extinction. Yet even as projects like Rwanda's solar array and Kenya's biomass plant take hold, questions remain as to whether African countries and international partners like Power Africa can effectively meet the challenge of electrifying sub-Saharan Africa, a place rife with political instability, government corruption, poorly managed centralized utilities, immature financial markets and logistical issues ranging from inadequate infrastructure to border conflicts. In a recent interview with the trade publication Institutional Investor, Paul Hinks, chief executive of U.S.-based energy developer Symbion Power and board chairman of the Corporate Council on Africa, said, "When you look at doing a deal with most African utilities, you're looking at sovereign risk." Power Africa and its affiliates are addressing such challenges by facilitating risk insurance and other forms of financial security to investors who act on their own or in partnership with African firms on energy development projects. Across much of sub-Saharan Africa, U.S. energy investors must also compete with China, whose holdings in Africa are expected to surge in value from $25 billion today to $100 billion by 2020, according to figures compiled by the World Resources Institute. In 2012, Chinese firms invested $3.61 billion in Africa's non-financial sector, including mining, manufacturing and power production, WRI's analysis of information from China's Ministry of Commerce found. Data from the China Global Investment Tracker, developed by the American Enterprise Institute and the Heritage Foundation, show that energy-sector investments and contracts by Chinese firms in sub-Saharan Africa totaled nearly $42 billion since 2010. "The reason for this trend is simple," Makhtar Diop, the World Bank's vice president for Africa, wrote in a recent op-ed in the China Daily newspaper. "The world's eyes are turned toward Africa's market of 1 billion people, including a growing middle class."